Plants commonly called lemongrass (Cymbopogon spp.) have grasslike leaves with a strong, lemony fragrance. Native to Africa and Asia, the plants are used as culinary flavoring and in perfumes, but they also have medicinal properties. Traditionally consumed as an herbal tea, lemongrass has been recommended by practitioners of traditional medicine for many different ailments. Modern research suggests that it may have significant health benefits. Lemongrass contains a number of volatile oils, including one called citral that's a mixture of several similar compounds. Information from Memorial Sloan-Kettering Cancer Center indicates that citral acts as an antioxidant that can help protect your cells from damage by free radicals. These unstable molecules form during digestion or when you're exposed to toxins. Over time, they can damage your cells and raise your risk of chronic disorders, including atherosclerosis and heart disease. Research published in the March 2003 issue of "Biochemical and Biophysical Research Communications" found that citral acts by activating an enzyme, glutathione S-transferase, that detoxifies free radicals and helps your body rid itself of them, but these laboratory results still need confirmation in trials with human subjects. Sloan-Kettering also indicates that extracts of lemongrass have anti-microbial properties, helping prevent or slow the growth of bacteria and fungi. A study published in the January 2012 issue of "Journal of Contemporary Dental Practice" found that an oil extract from lemongrass inhibited growth of streptococcus bacteria in the laboratory, while research in the March 2009 issue of "Phytomedicine" studied the effectiveness of a lemongrass infusion in human subjects with human immunodeficiency virus who had an oral fungal infection called thrush. Researchers found that an oral rinse administered three times daily was more effective than gentian violet, an anti-fungal medication. Larger studies are needed to confirm this benefit, however. Compounds in lemongrass also have properties that might help lower your risk of developing cancer. Several laboratory studies confirmed that lemongrass components could prevent growth of cancer cells. For example, a study in the October 2009 issue of "Fundamentals of Clinical Pharmacology" found that citral from lemongrass slowed the growth of breast cancer cells in the laboratory and also caused them to undergo a process called apoptosis, which causes cell death. According to the Sloan-Kettering, components of lemongrass might also have a sedative effect, increasing the time you stay asleep. 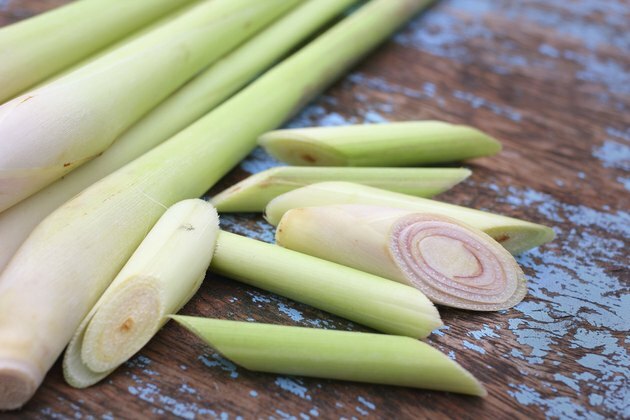 In addition, lemongrass may have anti-inflammatory properties that help suppress the activity of cyclooxygenase-2, an enzyme involved in inflammation that can cause pain in disorders such as arthritis, although these and other potential benefits still need further study. Fresh lemongrass is available at some specialty grocery stores or health food stores. You can brew a tea by bending and tying two lemongrass stalks with twine, then placing them in a cup and steeping them with boiling water for about 10 minutes, or until the tea becomes golden brown in color. Dried lemongrass is also available in ready-to-use tea bags from some stores. Lemongrass tea is generally considered safe and without side effects, although you should avoid it if you're pregnant. It might also interact with some medicines, including chemotherapy drugs. Discuss lemongrass tea with your doctor to decide if it might be helpful for you.